by Brannon, Evelyn L.; Divita, Lorynn R.
How do retailers decide which colors and styles are featured in their stores? What factors influence the patterns, textiles and silhouettes designers show in their collections? These choices are all made with the help of fashion forecasting-a dynamic industry that identifies the trends that influence what people will be wearing in the future. 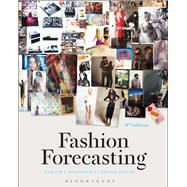 This text provides students with a comprehensive understanding of the forecasting process, from studying fashion innovation and cultural influences to conducting consumer research, exploring how to identify the who, what, where, when and why driving fashion change in our lives. New co-author Divita has revised the structure of each chapter to streamline content and improve the flow of information while discussing timely examples and industry applications. Ultimately, students will learn how to prepare and present their own fashion forecast. lecture notes, and sample test questions. PLEASE NOTE: Purchasing or renting this ISBN does not include access to the STUDIO resources that accompany this text. To receive free access to the STUDIO content with new copies of this book, please refer to the book + STUDIO access card bundle ISBN 9781501313172. STUDIO Instant Access can also be purchased or rented separately on BloomsburyFashionCentral.com. Evelyn L. Brannon is Professor Emerita at Auburn University, USA, where she was an Associate Professor of fashion forecasting, apparel design, entrepreneurship, and consumer preference. Lorynn Divita is an Associate Professor of Apparel Merchandising at Baylor University, USA.